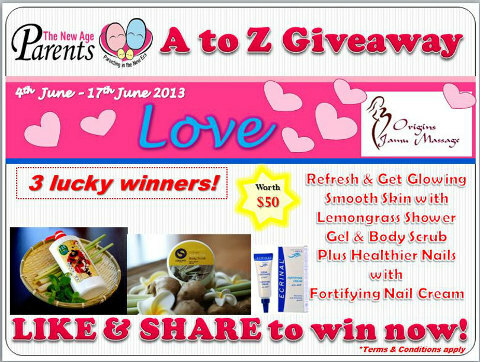 This fortnight’s Giveaway 3 sets of OJM Hampers (includes Refresh & Get Glowing Smooth Skin with Lemongrass Shower and Body Scrub plus Healthier Nails with fortifying nail cream) worth $50 each. Total 3 winners. Discover the Ancient Secrets of Jamu Postnatal Massage in the comfort of your home. We specialise in Jamu Postnatal Rejuvenating Massage for mums afterbirth. Using traditional massage techniques incorporating of lactation service and using of Hot Stone Compressed for detoxification, it is equivalent of a good home spa. To offer a comprehensive service, we provide complimentary baby massage classes, valuable tips and advices as part of our dedication to you. 2. Fill in your particulars via http://woobox.com/i5re77. Enter the email you used to join our mailing list. Hurry, giveaway for Love ends 17 June 2013.